Wharton-Smith Supports ACT Program | Wharton Smith, Inc.
Wharton-Smith has been supporting the Academy of Construction Technologies (ACT) for 15 years. 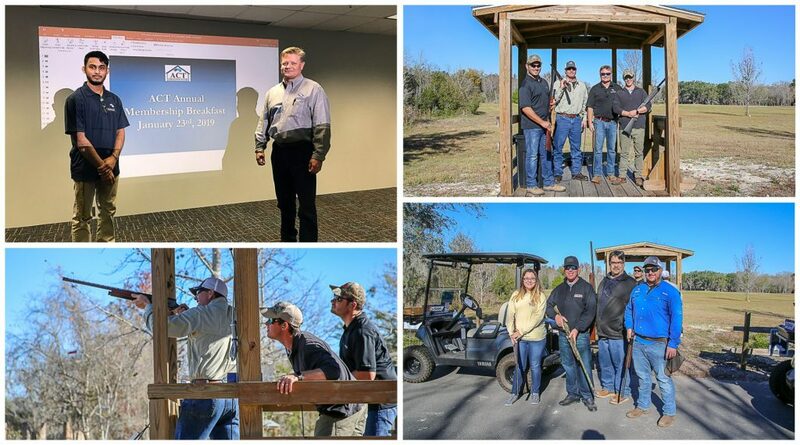 Most recently, Wharton-Smith team members participated in two annual events – the Clay Shoot at Blackjack Sporting Clays and the ACT Membership Breakfast at Orange Technical College. Proceeds from these events benefit the ACT Program, which prepares high school students for the vocational trades within the construction industry. After they graduate, many of the students continue their vocational development in adult apprenticeship programs. The Program works closely with Orange, Osceola, Seminole and Lake County high schools to utilize curricula developed by industry professionals. Beginning in their sophomore year and continuing through their senior year, students are trained within their chosen trade of Carpentry, Electrical, Air Conditioning, Masonry or Plumbing. They also learn the basic trade skills and safety practices needed to work on-site. In the summer, these students work full-time with a participating employer on construction projects within Central Florida. Every summer, Wharton-Smith employs several ACT students to work on our jobsites. One of our recent ACT students, Mohan Lochan, graduated high school in 2017 and chose to continue his education at the Wharton-Smith School of Construction at Seminole State College. Mohan currently works part-time on our Corner Lake Middle School project, where he is a vital member of our project team. He recently spoke at the ACT Membership Breakfast and shared his story and how the ACT program helped him choose a career in construction. “The most important experience I had during that entire summer was the final two weeks when the tilt walls began to rise and formed a building that would later become a school,” Mohan said. “After my senior year I decided to go back to Wharton-Smith. Today, I am a full-time college student and I’m going to be earning a degree in construction management so I may continue at Wharton-Smith for years to come,” he added. Thank you to all the Wharton-Smith team members who support the ACT program by working with the students and supporting their development each summer.